MORRIS PLAINS, N.J., May 16, 2017 /PRNewswire/ -- Honeywell (NYSE: HON) today announced that it has started commercial operations at its new manufacturing plant in Geismar, La., to meet the growing global demand for its next-generation mobile air conditioning refrigerant. With this start-up, the plant has become the world's largest site for producing HFO-1234yf, sold commercially as Solstice® yf. Solstice yf is an award-winning product that was developed by the company's team of scientists to meet the needs of the automotive industry to replace R-134a, the most widely used auto refrigerant. Solstice yf has a global-warming-potential (GWP) of less than 1, which is lower than carbon dioxide and 99.9 percent lower than R-134a, which has a GWP of 1300. R-134a is a hydrofluorocarbon (HFC), which many governments and industries have been looking at phasing out since the early 2000s. "Solstice yf is a breakthrough innovation that is helping the auto industry transition to more environmentally preferable technologies without sacrificing performance," said Ken Gayer, vice president and general manager of Honeywell Fluorine Products. "Honeywell invested significantly in research and development for more than a decade to enable our award-winning scientists to create new, near drop-in alternatives to meet the rising demand to replace HFCs. Solstice yf is one of the best solutions available to meet global requirements because it is safe for intended use and is capable of addressing both fuel efficiency and greenhouse gas emissions." 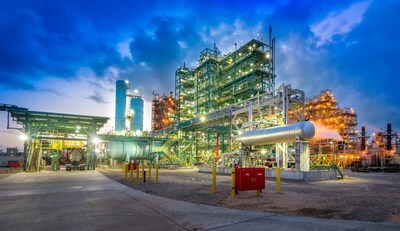 Honeywell invested heavily in the construction and supply of the Geismar facility, creating hundreds of long-term, high value, sustainable jobs for the local area. Geismar has increased its workforce by more than 20 percent and supported nearly 1,400 construction jobs as part of this project. With this investment, Geismar has become one of Honeywell's most advanced production sites. It will serve as the showcase for some of the company's own process and automation technologies, including Honeywell Connected Plant. "Our new Geismar plant will be a leading source of supply of Solstice yf for our global automotive customer base," said Rick Winick, automotive refrigerants business director. "As we have successfully converted our customers' fleets in the U.S. and Europe, this new capacity will enable Honeywell to help additional countries to meet their commitments to transition to next-generation, environmentally preferable mobile air conditioning refrigerants." Today, more than 20 million cars on the road safely use Solstice yf. That number is expected to surpass 40 million by the end of 2017. Nearly every carmaker in the auto industry plans to use the refrigerant in at least one of their U.S. models to take advantage of its numerous environmental benefits. Global adoption of this refrigerant will reduce greenhouse gas emissions by the equivalent of permanently removing more than 30 million cars from the road. Honeywell is a world leader in the development, manufacture and supply of refrigerants that are sold worldwide under the Solstice® and Genetron® brand names for a range of applications, including refrigeration, building and automobile air conditioning. Honeywell and its suppliers have completed a $900 million investment program in R&D and new capacity based on Honeywell's HFO technology. For more information about HFO-1234yf, visit www.honeywell-refrigerants.com.